Because I’m delivering this baby in a new city this time around, I’m working with a new doula and I thought I’d share the tips to prepare for labor that she shared with me at our most recent appointment. Many of these tips and supplements are ones I used during my last pregnancy (and I’d say they were effective! ), but some of them are new to me, too. Note: This post is not a substitute for medical advice nor is it a prescription. You should always consult with your own doctor before making any changes to your diet or lifestyle. Dates. Research has shown that women who consume 6 dates per day for 4 weeks prior to their estimated due date are more likely to go into spontaneous labor, have a shorter first stage of labor, and have a higher cervical dilation upon admission to the hospital when compared to women who did not consume any dates. [source] These Date Energy Balls, Raw Brownie Bites, and Peanut Butter “Cookie” Larabars are all a great way to increase your date consumption! Red Raspberry Leaf Tea. Red raspberry leaf tea is thought to help balance hormones and tone the uterus, possibly because it’s high in vitamins A, B, C, and E, along with important minerals like magnesium, potassium, and calcium. According to this study, red raspberry leaf tea has been shown to shorten the duration of labor and may reduce the need for medical interventions, such as the need for c-sections, forceps, and vacuum births. I’ve heard anywhere from 3 to 4 cups of tea per day is recommended in the third trimester, and I’m currently using this brand to make brewed iced tea. Alfalfa. This is something that I did not take during my first pregnancy, but my doula and many midwives recommend it because it naturally contains high levels of vitamin K, which is essential for blood clotting– and therefore it might help to prevent postpartum hemorrhaging. If you’d prefer to skip a supplement, vitamin K can be found in dark leafy greens like kale, spinach, and collard greens, and you can also brew alfalfa as a tea. Walking. Not only is walking a great low-impact workout for moms in general, but it’s also thought to help move your baby down into your cervix towards the end of pregnancy. Walking may also help to stimulate the release of oxytocin, the hormone that helps trigger and regulate contractions, so many moms nearing or past their due date might want to increase their walking to help naturally move labor along. What about Evening Primrose Oil? A common recommendation from midwives and doulas is to take Evening Primrose Oil either orally or vaginally starting around 37 weeks, as it’s thought to help ripen your cervix. I did sporadically use it orally during my last pregnancy, but upon doing further research, I found this study which showed that EPO taken orally does not help to shorten gestation or overall length of labor, and in some cases it actually increased the incidence of interventions. (In other words, even if it does ripen your cervix, there doesn’t seem to be an overall benefit from that.) Because I can’t find sufficient evidence that this supplement is safe or effective, I’m not including it in my list above, even though it does remain a very common recommendation in the natural health community. Prenatal vitamins. I mostly take these during the first trimester, then gradually fizzle out as my diet and appetite improve. Magnesium. I usually start taking this in the second trimester to prevent leg cramps and constipation, as well as to help regulate blood sugar. Collagen Peptides. I started using this again as a smoothie supplement during my third trimester, in the hopes that it would promote skin elasticity as my baby continues to grow. I regretted not writing down everything I did during my last pregnancy, so I hope that this list will help anyone in a similar position that might want to help their bodies prepare for the big day. While we can’t naturally control how or when we’ll go into labor, it’s nice to feel like we’re doing something proactive in the process! Reader Feedback: Did you do anything special to prepare for labor? I’d love to hear more tips and tricks in the comments below! You’ve got some great tips for giving birth! My wife is close to giving birth to our first son, so I’ll be sure to show her this. If nothing else, I’ll buy a ton of date nuts for her to eat, like you said. The third trimester of pregnancy is the most difficult period for expecting mothers. The baby is due any moment and utmost care must be taken of the mother’s health to prevent any untoward incidents. I had no idea that squats were some of the best exercises to prepare for child birth. My wife is currently pregnant with our first child and I want to make sure that the delivery is safe for both her and the baby. I definitely think that she should make sure to exercise and find a labor and delivery service to make sure that the birth is smooth and successful. Hi! Thank you SO much for these helpful tips. For the dates, do they need to be medjool dates or will 6 of the smaller dates work too? Thank you!!! Thank you for this information! I am 7 months pregnant and I keep coming back to this and some of the other posts you made while pregnant. I was wondering what you thought about placenta encapsulation? I am considering having it done and I know there aren’t a whole lot of studies about it so I am curious if different people’s experience. I’d be interested in any thoughts you have 🙂 Thanks! With my second baby, my doula offered placenta encapsulation so I went for it! She was already at the birth, so she took the placenta with her and delivered the capsules and a few tinctures to me a few days later. I have to say, I was already feeling FANTASTIC before she even brought them, because my daughter latched perfectly for breastfeeding, and we get great sleep together… so I feel like a totally different person, even without the placenta pills. However, I’m happy I tried them, and I still take one every now and then for an energy-boost. My husband has actually tried them, too! So, I think they are worth a shot if they fit in your budget. Did you do the complete Hypnobabies course? Or did you just do the Hypnobabies home study course? Did you incorporate the Bradley method at all in your birth? Would be great to know more about how you made those decisions. I am 4 months pregnant, and trying to decide what method(s) to go with. I just did the home study Hypnobabies course with my first pregnancy. (Though I don’t think I finished it…) I found the affirmations most helpful, so that’s all I listened to with my second pregnancy. I did not use the Bradley method at all, but I also didn’t incorporate any “techniques” into my labor. I think you mostly need a positive mindset, so Hypnobabies helps with that, but my body told me how I wanted to be with each contraction. (Usually breathing on all fours.) I definitely recommend getting a doula, though! I used one both times, and just having their support is really comforting when the time comes. When do you start the tea and dates ? 36 weeks? Dates are always good for you, so the sooner the better. People in the Middle East, and Muslims around the world, eat them often and use them to break their fasts during Ramadan and at other times. The Quran tells the story of Mary giving birth to Jesus near a palm tree, and she is told to shake the tree to make dates fall for her – so the idea of dates are helpful for giving birth is very old. Thank you so much for sharing those tips with us! I’ve already started increasing my intake of dates and raspberry leaf tea. I also practice the malasana pose regularly to stengthen my pelvic muscles. I hear it’s also great for your back if you have a lot of disconfort towards the end of your pregnancy. I am currently 36 weeks pregnant with baby #1, so I can’t wait to see if all the efforts help with my labor! Enjoy the rest of your pregnancy!! Ok, so a little heads-up now that baby is three months old! I was induced at 42 weeks since I was showing no signs of giving birth and was uncomfortable with the idea of going postterm. At that time I was 50% effaced and barely dilated. My labor was 38 hours long without any breaks and I pushed for an hour and ten minutes. 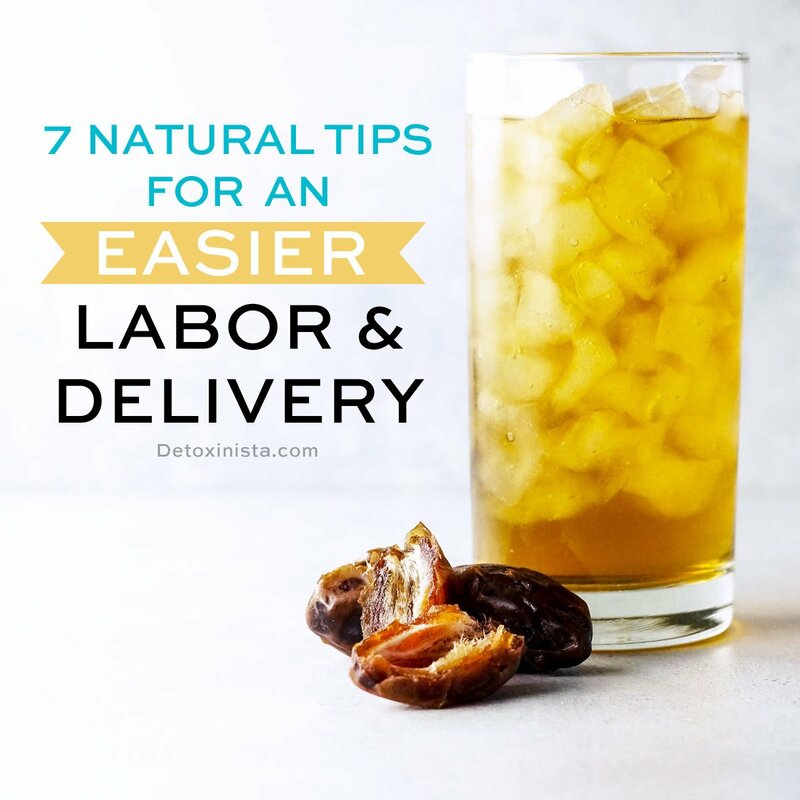 I don’t regret trying my best to facilitate my labor, at least I got healthy alternatives to other drinks and foods and great workout ideas from this post, but I don’t think they had an influence on my labor. They rather helped me stay healthy and fit during my last trimester. I’m not looking to create any controversy, I just thought I’d share my experience. Have a good day! –labor advice from the Bradley Method. This is traditionally advice that the partner (often Dad) will use to soothe Mom, but I used it all on myself b/c I didn’t want to rely on others to regulate MY moods, body, etc. The visualization and breathing were incredibly useful to keep anxiety at bay, and to manage pain naturally. I hope you find these as empowering as I did! I also wanted to know: have you read anything about being able to avoid the antibiotics for people who are Group B Strep positive? I did test positive for GBS during my last pregnancy, but we didn’t know that until after my son was born, so we did manage to avoid antibiotics simply because we didn’t know any better– and I only arrived to the hospital 20 minutes before pushing him out. When we heard the test results the next day, they simply monitored him to make sure he showed no sign of infection. Had I tested positive before delivering, I’m not sure I would have had any other options, because even my midwife insists on the antibiotic protocol just to be on the safe side. Great tips. One thing about squatting is it depends on how your feet are placed whether your pelvis is opened or closed. Squatting for delivery is encouraged because it opens the outlet of your pelvis by up to 30%, however it closes the inlet of your pelvis in the process. IF your baby is not engaged yet, you wouldn’t want to do squats unless your feet are in a nueetral position. Feet placement is important when it comes to squatting, if you feel your sits bones as you squat, you can feel whether it’s opening or closing the outlet of your pelvis. I will also add most people don’t squat correctly. Gail Tully of spinning babies teaches proper squatting, a supported squat with a partner is great, feet should be parallel (not pointed out or in and remain on the ground) and you go down you sit back like sitting in chair, this is done while holding your partners hands and mirroring what they’re doing. I’m a certified experienced birth doula and trained with Gail Tully in spinning babies techniques. I’m not pregnant but I will totally try the raspberry leaf tea for my menstruation pain. Thanks! I did the squats too to prepare for labor and delivery. I was told by my doula to not even try to prepare because you never know what’s going to happen…..you can make this awesome great plan and then it can blow up in your face. As it turns out my doula told me during my 1st labor that I was being a major wimp and was probably only 1 cm dialated. As it turns out, I was 10 centers dilated and almost ended up giving birth in the elevator. My doula was like…ooops. My doctor didn’t make it even close to on time and a nurse delivered the baby on the spot the second I got into the labor room, baby came out! Exciting though and I got the drug-free labor I wanted. One huge advantage of going naural is your baby is super awake when born and you REALLy bond with them!!!! This is just like my birthing story! My doula didn’t even make it to my house because she told me to “wait until it becomes really uncomfortable”. Well I did wait. My husband and I decided it was time to go to the hospital. My body was pushing with each contraction and my water broke as we pulled up to the hospital. I gave birth 10 minutes later. Although dramatic, I love my birthing story and really wouldn’t have wanting anything different. Since I did most of it home I needed no medical intervention just a few stitches afterwards? Love your website! Would love more recipes for picky toddlers! Since the labor and delivery of my first child was 32 hours and required intervention I wanted to do as much as I could to prepare for my second child’s birth to prevent that from happening again so I ate dates, drank the tea and got chiropractic care during the last trimester. It all payed off when I had a pretty easy time birthing my son this time who was 2 lbs heavier than my first! I’m so glad to hear that the second time around was easier for you. Sounds like you were a champ for the first one– 32 hours would leave me exhausted! I have a bit of a skepticosm for some of this advice. But it’s because I had been given opposite advice during my last pregnancy. My obgyn told me to not take vitamin k while pregnant because it is a blood thickener. And could lead to complications during delivery. it’s interesting you were told the opposite. Also, I’ve been avoiding teas lately because according to the Canada health website (I’m Canadian. So they are the health authority here) they caution mothers against teas (particularly chamomile) but others as well since they claim not enough research has been done to confirm any side effects or complications from them. They say there is not enough research around teas to give them the green light. What does a doula do? How do You get one? Are they covered by insurance? A doula is a prenatal and labour/birth guide. They try to give you a lot of information to help you discover what your preferences are for your labour and birth. Depending on if your having a hospital birth or home birth they can also let you know about the policies and procedures at your particular place of birth, as every place has its own standards of care. A doula is there to help you emotionally and physically cope through your labour and also provide hands on support. They are not medical care providers but they do have a good amount of knowledge to help you during your pregnancy and labour. A doula also can support your partner during your labour, but doesn’t take over their role- also depends on what their comfort zone is 😉 If you want more information, I would imagine where you live probably has a doula association. Or you can check out DONA (North American organization) or CAPPA (which is Canadian organization). I am in Canada as well… Most cities have organizations! And you should be able to get a doula! Doulas are not covered by Canada health, but some insurance companies do cover doulas if you have s generous health care spending account. And in some provinces can be claimed through your taxes. Hope this helps! Thank you! I really actually appreciate you sending me all that info!!! I will check it out! I’m currently only 8 weeks along with my (hopefully) 2nd child. Hoping to get last week 13 so that chance of miscarriage (however small at this point.) is not as concerning. I didn’t have a doula for my first. I wonder if it would have helped. I will absolutely check to see if I can get a doula this time round. My husband … God bless him. Was more like a deer in headlights during the last birth. Lol! Thank you for taking the time to post that information. I appreciate it. I definitely wouldn’t recommend drinking any other tea during pregnancy, as many herbal teas can have potent side effects, but I shared a link to the research in my post above showing that Red Raspberry Leaf tea has been shown to shorten labor and possibly reduce the need for interventions. Stefanie shared great info regarding doulas! Mine has attended nearly 500 births, so she has seen it ALL– and that experience can be really valuable when the time comes! Interesting about the teas! American pregnancy association seems to say that the tea you mentioned was thought to be benificial as well. Whereas other health sites don’t mention it at all and lump all teas together. No wonder people find health information so confusing! Ill discuss it with my Doctor. Cheers! You may get more information discussing herbal teas with a herbalist. As doctors don’t generally study herbal medicine they tend to say avoid it as they are covering themselves. I immediately thought of this guy when you were discussing why you planned on having your baby at the hospital. My midwife (at the doctor’s office) also recommended Red Raspberry Leaf tea after week 37.